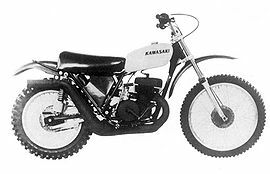 The Kawasaki F12MX was a 450cc, 2-stroke, off-road and motocross motorcycle manufactured by Kawasaki for the production year of 1973. This was the largest displacement motorcycle in the Kawasaki F-series and had a downswept muffler and CDI ignition system. The F12MX lead directly to the 1974 manufacture of the Kawasaki KX450, another motocross bike. The Kawasaki F12MX currently can participate in AHRMA sponsored events in the Sportsman 600 which are 1974 and earlier machines manufactured as 251-600cc, including like-design models. Kawasaki manufactured a road racing version of this bike known as the Kawasaki A1R. This page was last edited on 26 August 2010, at 18:03.